This past Sunday brought us the heaviest and most unsettling episode of The Walking Dead ever. From last weeks preview we knew it was going to be unsettling, but who could have imagined this much. By the time the episode ended, we were completely overwhelmed both psychologically and emotionally. I shudder at the thought of diving deeper into this episode, but I must. So let’s take a deep breath and take a closer look at the episode “The Grove”. As the episode opens we spy an empty kitchen with a teakettle on the stove, an old record playing and a little girl running around outside playing. As the scene continues, the teakettle starts to whistle as we find that the girl is actually laughing and playing with a walker. This juxtaposition of death and laughing is disturbing as it is, but adding in the sharp building whistle of the teakettle makes you shiver with discomfort even more. This was the preview we saw during the earlier week’s Talking Dead; and from the get go we knew this episode was going to be just as disturbing – unless it all turned out to be some flash-forward to a time when we’ve learned to domesticate walkers. Spoiler Alert: It’s not. This episode constantly pulls us between discomfort and relief until finally – like the whistle tea pot – shattering our peace of mind. One constant of this episode was the mysterious fire. 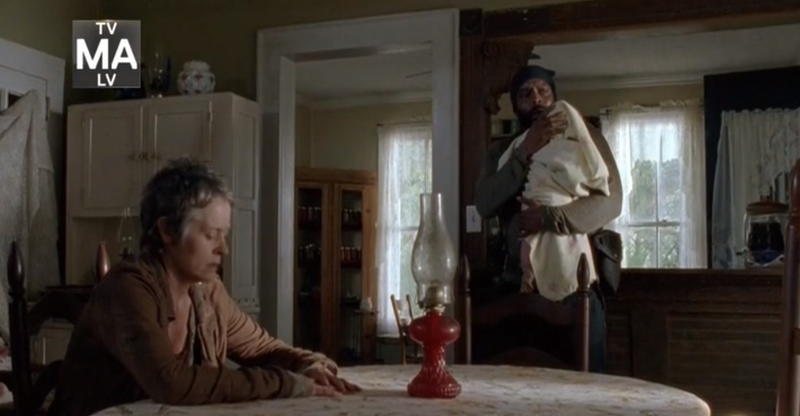 When Carol first smells it, she isn’t too sure what it could be, but Tyreese knows the smell all too well. The whole theme of the fire – and the burned walkers that come at them later on – brings up memories of Tyreese’s wife who was found charred and burned while back at the prison. We the audience know this was all Carol and so this starts to build the tension of when is she going to let Tyreese know that it was her. The other thing to note about this fire is its cause. Now nothing was confirmed and we don’t really have any timeline for how these divided episodes are taking place, but there is a fairly good chance we know what fire this is. Remember a few episodes ago when Daryl and Beth set that house in the woods on fire with moonshine? This fire could be that house. As for the burned walkers the gang encountered, remember that walkers are attracted to light and movement – basically the only two things their decaying vision can make out. A burning house fulfills both criteria. So even though there were no walkers in the house to be burned, the roaring flames would have attracted walkers – thus accounting for the varying severity of their burns. 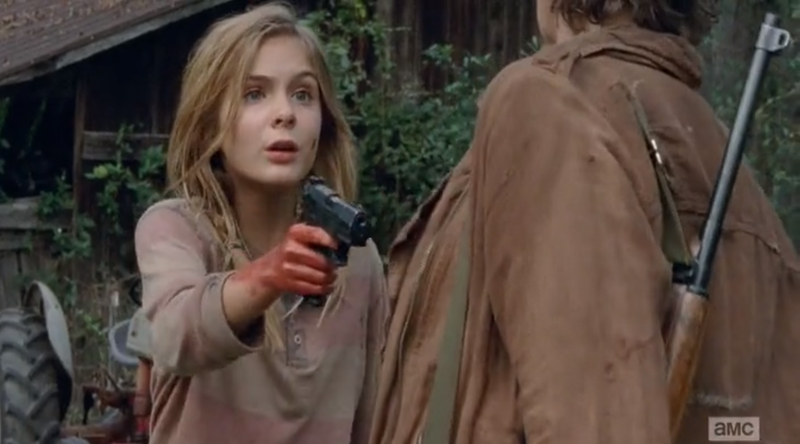 Early on in the episode, we learn that Lizzie shot both of Tyreese’s attackers. The strange part is that she is sad that she shot them in the head. Since our first introduction to Lizzie when she and some of the kids were naming walkers, we knew something was off. She believes that the walkers are still people. This is an idea Herschel himself once held, but he quickly realized that he was fooling himself. Though despite sharing this idea, Herschel at least recognized them as sick and wrong. Lizzie on the other hand sees nothing wrong with them. In fact, she sees them as almost the next step in evolution. Carol warns Tyreese of this and he gets to see it first hand when Lizzie stops him from killing a walker that has fallen between the railroad tracks. It’s strange how Lizzie has such a soft spot for walkers and yet is perfectly fine with mutilating bunnies and smothering babies. All things considered though this can easily be shrugged off as a girl who is tired of all the killing, which is what Tyreese does as he lets the fallen walker live. The first true moment of clear insanity is still to come. After coming across a house in the forest, Lizzie and Mika sit outside while Tyreese and Carol sweep the house. Lizzie spies a grave marker with infant shoes hanging from a makeshift cross of twigs. Despite this being the grave, she thinks the baby rose and is still inside and that they’re going to kill it. Mika tries to talk some sense into her sister – who coldly replies “you’re all wrong” – but they are interrupted by a walker who appears from another door way and tries to attack the girls. At first glance it seems as though Lizzie is scared of the walker, but that is not the case. If you watch this scene closely you’ll notice that Lizzie is breathing heavily only because she was startled. She makes no effort to move and only starts screaming while Mika is shooting at the now crawling walker. 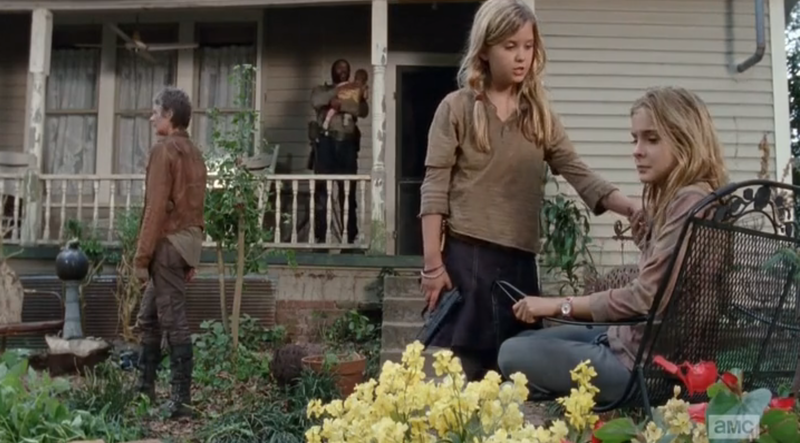 As Tyreese and Carol run out of the house, you can see Lizzie actually extend her hand towards the now motionless walker. She keeps looking at the motionless walker as if she just lost a friend and is only able to be calmed by her and Mika counting to three while looking at the flowers. While talking with Mika later on, Carol tries to tell her she has to be stronger. She doesn’t want Mika to end up like Sophia, but Mika says that she won’t kill people and will run instead. Coincidentally, this is also what killed Sophia – and Carol points it out. Carol sees the pure innocence in Mika and how she believes that “everything works out the way its supposed to” – words her mother used to always say. Thankfully Mika knows she has to kill walkers, which she does to save Lizzie and Judith when a walker comes at them outside the house. Although right after this scene, we see how Mika is overly excited about naming a doll and subsequently playing with it. 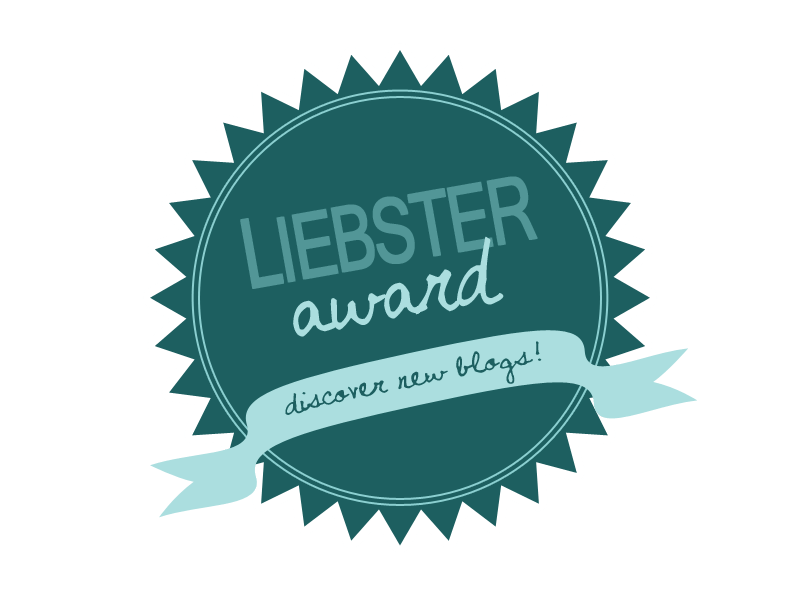 This world changes everyone – some for the worst, others for the better. Mika refuses to change who she is, even if she is the one that must suffer because of it. Sadly, Mika isn’t the only one refusing to let go of a horrible idea. When we see Carol putting up a teakettle, we instantly know what scene coming. Carol sees Lizzie being chased by a walker and immediately runs to “save her”. As Carol approaches, Lizzie stops running to say that its okay; meanwhile, the walker is getting dangerously close to biting her. Carol pushes her out of the way just as the walker is about to connect, and then drives a knife into its head. This scene – besides being psychologically disturbing – is also brilliantly acted, which makes it all the more powerful. 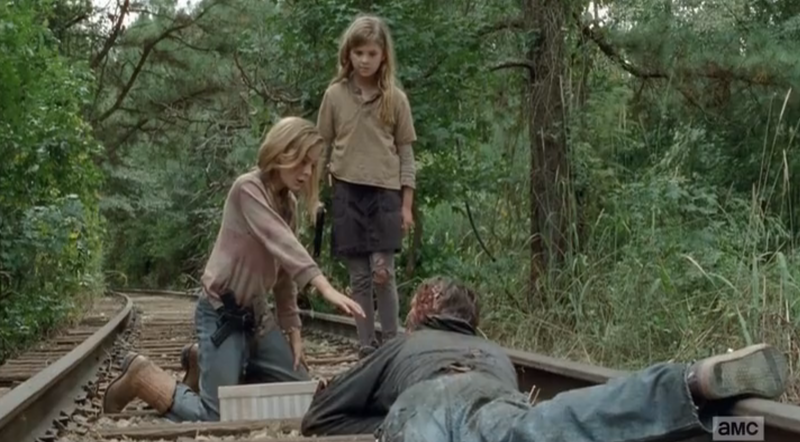 Brighton Sharbino (Lizzie) and Melissa McBride (Carol) just earned the awards for best acting of the season – if not the series to date. Lizzie is completely enveloped by her delusion that these walkers are still people, and worse, that they are automatically friendly. She scream at Carol as if she just murdered her sister, and when faced with the fact that it was going to kill her, Lizzie responds “What if I killed you?” She sees it as the same thing, but actually even worse than what the walker would have done. If Lizzie died, she’d come back if her head was unharmed. What Carol did would silence it for good. Brighton not only delivers her lines flawlessly, but her physical acting is what makes this pure perfection – as far as acting goes. You can actually see her body trembling as she suffers this mental snap. You can just feel the abyss of dark feelings boiling under the surface, adding complexity upon this delusion. Melissa’s final glance is just perfect. You can hear her pleading words beforehand and the pain in her voice when she’s trying to reason with Lizzie. Though none compare to the simple look Carol gives at the end. The expression on her face perfectly conveys just how hopeless Carol’s realized the situation to be. Her look is more than just a “she’s crazy”, because the situation is far beyond that. It’s almost impossible to process the hopelessness of the situation when a young girl shed tears and anger when a walker is killed, but shows zero regard for her actual life or anyone else’s. Let’s not forget Chad L Coleman’s (Tyreese) “what in the world?” expression while watching this whole scene from the kitchen window, but his greatest moment is still to come. We are just getting to the climax. Since the beginning of this season, we had one huge unsolved mystery: who was feeding the walkers? Outside the prison gates, we saw that someone was feeding rats to walkers, which eventually lead to there being a huge build up on them until the gates collapsed. 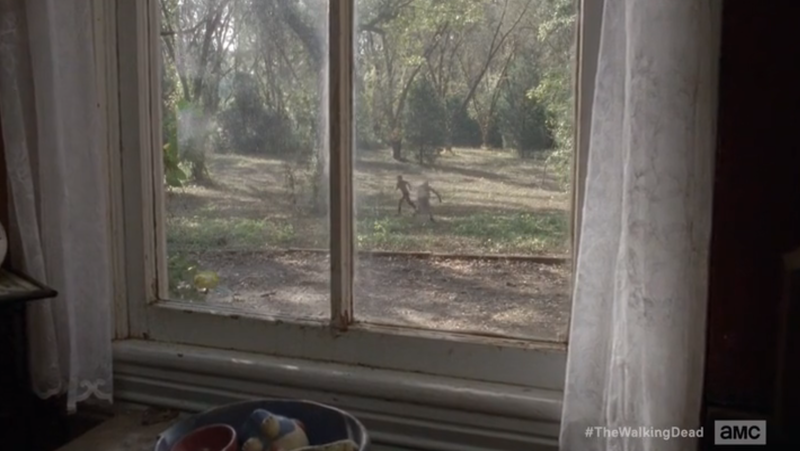 A few episodes ago when we saw Lizzie kill that family of bunnies, people – me included – started to speculate that it was her who first started feeding the zombies. Well, it turns out we were all correct. 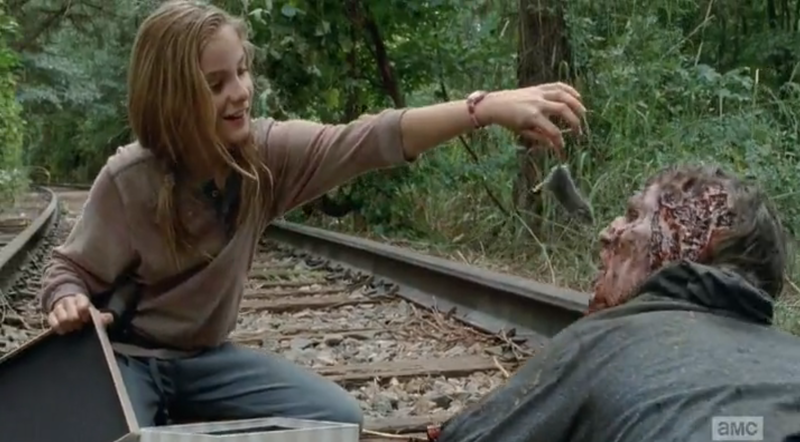 Mika finds Lizzie sneaking a rat to the fallen walker she begged Tyreese to spare earlier this episode. When Mika discovers this she confronts Lizzie, again trying to talk some sense into her. They just want me to change, to make me be like them. Maybe I should change. I can make you all understand. Once again, Lizzie doesn’t listen, but then decides that she will become like them so she can prove everyone wrong. Just as she is reaching her hand out towards the snarling walker, a group of burned and crispy walkers come out of the trees causing Mika and Lizzie to run. Once back with Tyreese and Carol, they all – Lizzie included – shoot the walkers. Afterwards, Carol embraces Lizzie thinking – as we all did – that she finally understands. With the climactic showdown with the Fire Walkers over, all is fine and the episode seems over. Then, you realize there’s almost a half hour left of the episode, and you know something horrible is coming. Now you might be asking why did Lizzie run here but not other times. The reason is possibly this. She sees these walkers as good, just being lonely, but the sight of burned walkers showed them as snarling angry beings. Lizzie’s delusion has taken this into account. Just as she gave the walkers different names at the prison she sees these walkers as all different. These fire walkers were bad ones, thus why she decided to run and shoot. If she wanted to prove her case, she’d need a good walker, which brings us to the saddest, most haunting moment this season. After the shootout, Carol speaks with Lizzie and asks if she understands what they are not. Lizzie answers,“I know what I have to do now”. Originally, we all assumed this to mean ‘she knows that the walkers are bad, that they’re not people and we have to shoot them.’ Sadly, that isn’t what Lizzie resolved herself to do. As Carol and Tyreese return from hunting, they find Lizzie covered in blood standing over Mika’s dead body with baby Judith only a few feet away. The look of horror on their faces is exactly what everyone watching is feeling right now. Lizzie’s only smiles and says that they shouldn’t worry since she’ll come back – she made sure not to hit the brain. When Carol finally takes a step closer, Lizzie pulls a gun on them and explains that they have to wait so that they can all see that she was right. Carol talks Lizzie into handing over the gun, right before Lizzie reveals that she was just about to ‘change’ Judith too. You can hear the crack in Carol’s voice as she holds back to keep calm and reply that its not a good idea because Judith can’t even walk yet. 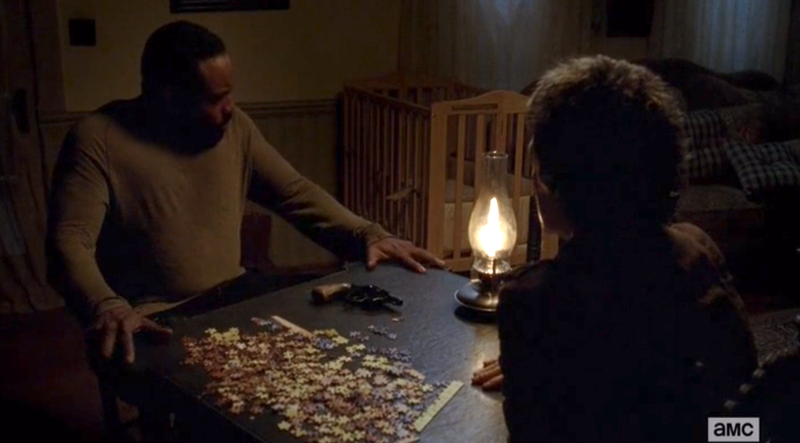 Afterwards, Tyreese and Carol discuss what they should do – after putting Lizzie in her room and removes all weapons. Carol first offers to take her away because she can’t be under the same roof with Judith, but she knows that will also condemn Tyreese and Judith to death. There would be no way they could make it on their own. Tyreese wonders if they can talk her back, but Carol knows by now there’s no talking it out of her. Plain and simple, “she can’t be around other people”. Whether playing with walkers or turning people into them, “she can’t be around other people”. 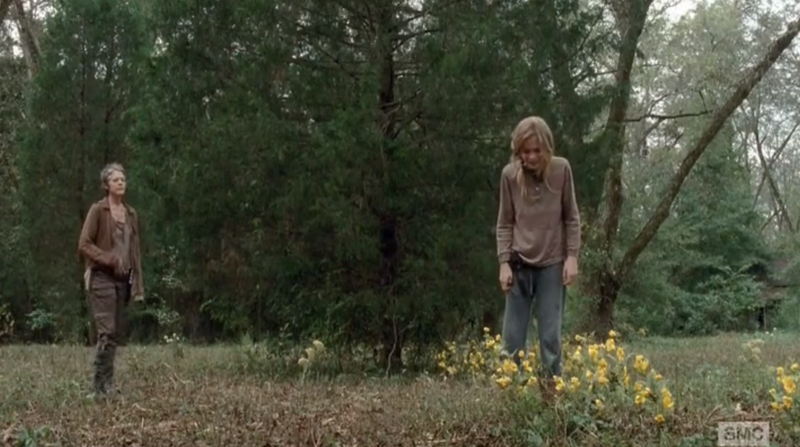 When Carol walks Lizzie into the woods – very Old Yeller-like – you can see that Lizzie still doesn’t get it. She shows no remorse nor offers any apology for killing her own sister. She thinks her only transgression was pulling a gun on Carol. When Lizzie starts crying, Carol tells her “everything works out the way it’s supposed to” – words that their mother used to tell them, and words that Mika told her the day before. She tells her to look at the flowers as she pulls her gun. As she walks back after the deed has been done, she spies a deer – the thing she has been hunting for the past few days – but she can’t bring herself to kill it. There’s been enough death today. Now if you’re a fan of the comics, you know that there is no Lizzie and Mika in them; however, there are two characters that are strikingly close – possible who Lizzie and Mika are based off of – Ben and Billy. Billy is very much like Mika, kind and sweet. His brother on the other hand Ben has some serious issues – mutilating animals being one of them. Eventually, Ben kills Billy. Though its not Tyreese or Carol who take Ben down – since they’re both dead in the comics. It’s actually Carl who does the deed while everyone is debating what to do with him. Early on I mentioned how Carol got upset when the girls referred to them as like their mother. Carol – still suffering from Sophia’s death – can’t hear these words, but in many ways, she has become like their mother. Sadly, this episode shows us all the ways Mika and Lizzie weren’t like her daughters, but rather were her DAUGHTER. In the opening scenes, we see how Carol echoes her description of her daughter when describing Mika. Mika was a being of pure innocence – that could run – just like Sophia. On the other side of this we have Lizzie, who is nothing like Sophia . . . when she was alive. 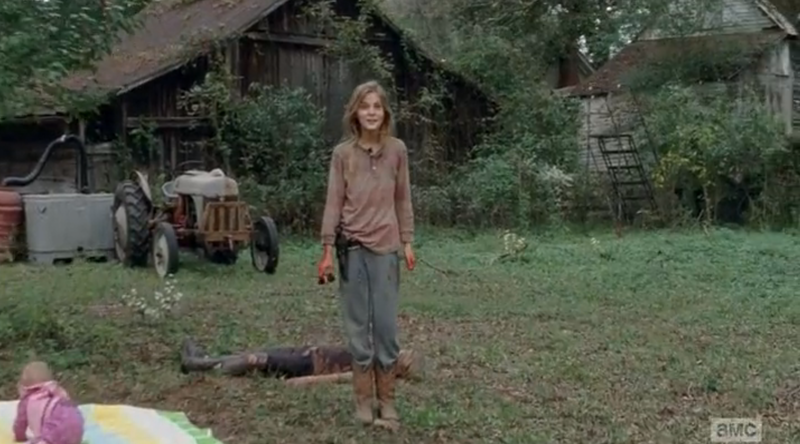 When Sophia walked out of that barn a walker, she was no longer the sweet little girl, but a monster. A monster with the guise of a girl. That is what Lizzie was. She couldn’t be around people and caused so much pain and death. This episode, Carol again witnessed the dual death of her daughter Sophia: The innocent daughter (Mika – Sophia) and the daughter who had to be put down (Lizzie – Walker Sophia). During the middle of the episode, we see how Tyreese doesn’t want to move on to Terminus because he’s not ready to trust other people. “I know you, I trust you”, he says to Carol. Little does he know that Carol actually was the one who killed Karen and David. Later on while hunting and discussing how to fortify the farm – escape route included so they don’t make the same mistake of the prison – Carol thinks about telling Tyreese. You can hear her stop herself as she chokes on the words and changes the subject to how you should carry their memories with you. At episode’s end though, she tells him. Carol sits Tyreese down, puts a gun in front of him, and tells him how she killed Karen and David to stop the infection from spreading. This is where Chad L Coleman’s acting comes into play. You can see him struggling with this revelation as he grips the table in anger and then the gun. We’ve seen him flip out before, so everyone watching is expecting it – but he doesn’t. 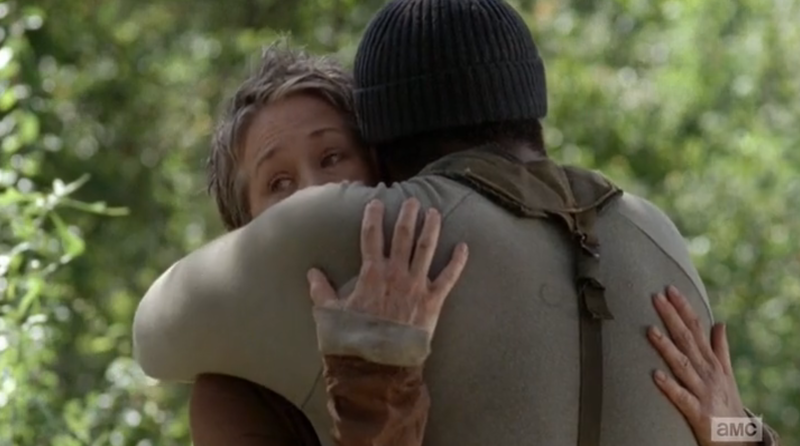 After everything that has happened this episode, Tyreese knows that Carol is all he has left. Though it’s more than just that. 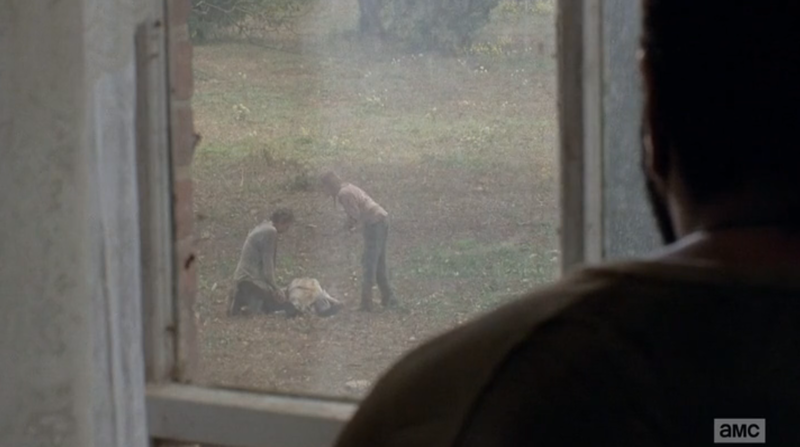 Remember how Tyreese constantly appeared at the window to watch what Carol was doing? That wasn’t shown to make you think he was a creeper. He saw what carol was like. How he cared for the girls, and how it affected her to put one down. He knows that she cares and despite that has to make the tough calls no one else can/will. If she was like that with Lizzie, she could have been like that with Karen and David too. Tyreese forgives her knowing that she’ll carry the thought of it with her. It wasn’t a stranger or a delusional little girl. It was someone who knew what she was doing, what had to be done, and has carried the guilt with her ever since. If Carol had told Tyreese before all of this, it probably wouldn’t have ended so nicely. He had to have everything put in perspective, and see Carol for who she really is. After an episode such as this – and with only two episodes left this season – I can’t imagine what’s coming. 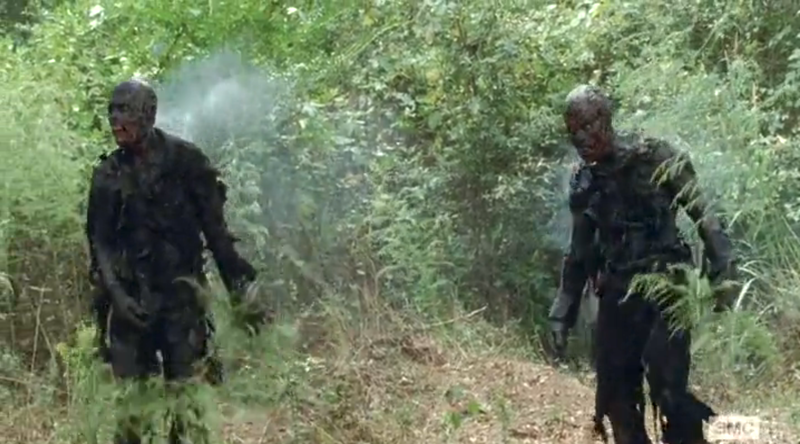 Carol, Tyreese, and Judith head off for Terminus while the others are on their way as well. Next episode will see Daryl with his new group, and how he’s . . . dealing with them. This season has more than made up for the drawn out slow pace of last, and has hit us harder than we thought possible. Do agree that the juxtaposition of Lizzie playing with the walker amidst the calm, home setting was chilling, almost eerie, but it helped establish the tone of the episode. I do feel Tyreese forgiving Carol was a bit too easy and I feel that he hasn’t fully forgiven her yet, but as he said, she’ll never forget it. And like Rick said, Karen and David MIGHT have lived if given a chance. Carol made the tough choice. Not what may have been right, but what she felt was necessary. And it’s something she’ll have to live with. Tyreese knows that. And given how they just lost both Mika and Lizzie, I doubt Tyreese, even in his anger, would want to burden Carol with his anger. Though I do believe that if Carol had admitted to Tyreese what she did during their previous scene together, before Lizzie killed Mika, I’m inclined to believe he might have killed or at least flipped out at her. Though I do wonder what made Tyreese and Carol think, even for a second, that leaving two unhinged girls alone with a baby was a good idea. It’s not the first time the girls have been by themselves, but really, they could have been more careful. I wasn’t a fan of how often Lizzie and Mika seemed to shift personalities within the same episode, where sometimes they’re afraid of walkers, sometimes they think they’re just different, sometimes they can kill and sometimes they don’t have to, it was inconsistent. But since they’re dead, I don’t see it being a giant issue. Good episode and recap. An excellent recap and review of this very difficult episode. The first comment I have is that Brighton Sharbino and Kyla Kenedy as the two young girls were fantastic. Brighton, in particular, was 100% convincing. Very impressed to see such outstanding acting from two young actors. Carol has been a favorite of mine from the very first. She was so beaten and humiliated in the beginning and has grown into such a powerful and resourceful leader – but, dang, now she’s the one who has to do the really hard stuff and she has so much to bear. I’m loving what they’ve done this season: splitting everyone up and charting their journeys to find each other again. (Assuming that they will be reunited at Terminus.) It’s given them a way to let characters develop with full episodes devoted almost exclusively to just one or two characters.